We went with SIena Fence up in Clifton Park for ours (a white vinyl picket fence), they did a good job with it and we're happy 3 years later. I'll throw my hat in with Siena. Competitive prices and good work. Bruce Fence Company came through for me in a big way last spring. Another local fence company gave me a price and a date and then faded away. (Perhaps a bigger job came along, but have the decency to call.) Needless, to say this failure to keep the date as promised created frustration with the neighbor on the other side of the fence. From my first telephone contact with Bruce to my first visit in their office and then through to completion of the job, every interaction was friendly and professional. The entire transaction went like clockwork. Even the neighbor liked the final product. We went with AFSCO Fence for our house and were thrilled with the results. The staff was knowledgeable, courteous, and worked quickly. We had to wait a few weeks longer than we hoped to get the work started, but I looked at it as a testament to their reputation that so many people wanted to hire them. 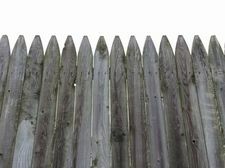 Whatever contractor or company you decide to go with make sure they are knowledgeable about the building codes regarding fences in Albany and the permit-pulling process, especially if you're on a corner lot. I also had a good experience with Bruce Fence Co, about 9 years ago to install a 6 ft. cedar fence in my back yard. They were scheduled for a bitter cold day in December and not only showed up, but cheerfully worked in brutal weather. My one bit of discontent with Bruce Fence is that quite a few years later (well after the warranty), a gate post developed a bad warp and is now completely twisted and soon I won't be able to open the gate. I realize wood is natural and therefore unpredictable and I'm happy to pay for the repair, but Bruce's repair charge is extremely high (compared to their competitively affordable charge for the whole fence installation). So right now I'm mulling over what to do about the problem. And, yes, it's important to get the proper building permit. And touching base with all your neighbors is a good idea to let them know what you are having installed and clarify your boundary lines if anything is in question. I had trees and shrubs growing on shared boundary lines and decisions had to be made if the fence would bisect a massive lilac bush. My neighbor was a good sport about having to lose part of that lilac. Good fences make good neighbors, but good neighbors also make good fences. We have used Long Lumber for lots of things cedar-related and have been super happy. We bought our fence from them and then installed it ourselves, but I'm pretty sure they do the installations as well. And I'll second that whole "talk to your neighbors" thing. Neighbors on two of three sides had special requests. Long Lumber has a great variety of fencing styles, and they recommend Empire Fence, who completed our installation and we have been extremely happy with it.